Now it is clearly noticeable: the stars appear earlier and observing during the evening is once again a possibility. Which highlights does the Autumn sky have to offer us? 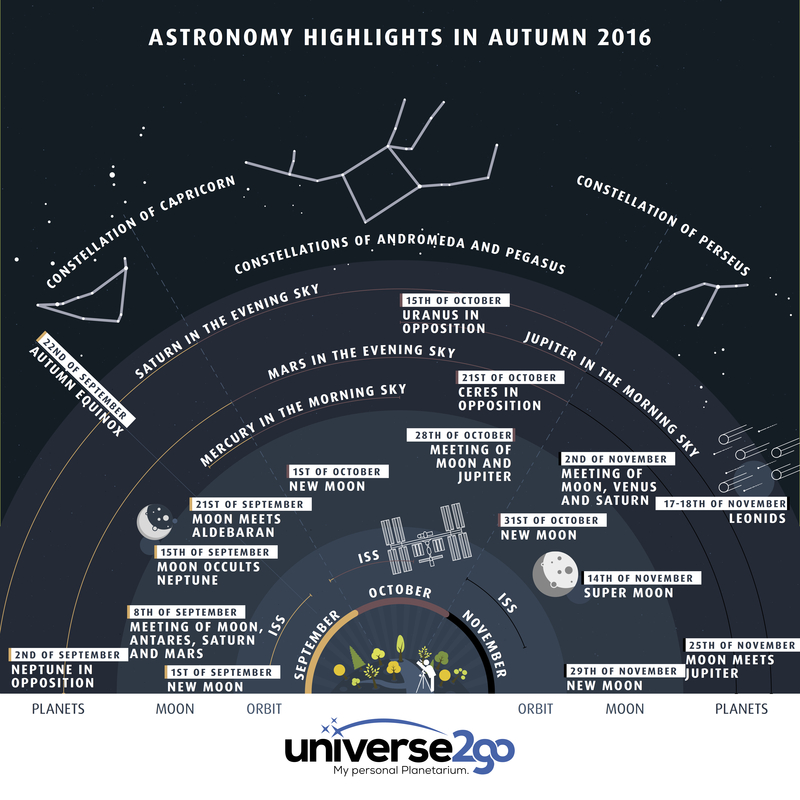 Our new infographic “Astronomy Highlights Fall 2016” shows you everything at a glance, that will happen during the months of September to November. The distant planet Neptune, will stand in opposition on 2 September. Seeing the blue pearl through a telescope is certainly a special event, given the distance of 4.4 billion km between us. At such a distance and with a telescope, you can dream of the depths of the cosmos! Neptune will appear late in the night sky and will be visible for the entire night. Shortly after midnight, observing conditions will be optimal, as the planet reaches its highest position in the night sky. Currently, there is a wonderful constellation of the planets Mars and Saturn near Antares, the main star of Scorpio. On the evening of the 8 September, a half moon will grace the western sky. The quartet can be seen shortly after dusk. On 9 September, the view will be impressive, although the Moon will be further east in the sky. On this night, the full Moon will obstruct our view of the planet Neptune. The occultation will start in the evening, and last approximately 45 minutes, and will be visible at the southern edge of the Moon. In central Europe, there will be a lunar eclipse. Although not total, nor even partial, it will be a penumbral lunar eclipse. The Moon will move into the shadow of the Earth, which means it will appear darkened. At a closer look, it is something noticeable, but to those unaware rather inconspicuous. Expect to see a darker Moon as it rises and it will move out of the Earth’s shadow at approximately 10:56 PM CET. The Winter is sending us messages, as Winter constellations appear again in the east. Around 10:30 PM, you will see through the mist on the horizon the constellation Taurus with its main star Aldebaran. Not even the diameter of a full Moon, the constellation will be visible the entire night. As the night proceeds however, the Moon will move further away from the red star. Today is the beginning of Fall. The days and nights are approximately the same length, meaning it will be darker, earlier with a night of about 9.5 hours. A cool air could disturb observations however, so be sure to take a jacket with you. After Neptune’s time in the spotlight, Uranus is now getting all the attention. The seventh planet will be in opposition on 15 October and visible the entire night. As darkness falls, you will see a 5,7 mag star in the constellation Pisces. Around midnight, it will reach its meridian and is then best to see. Unfortunately, bright stars won’t be seen in the vicinity of Uranus. A couple of 5th class stars, which are only visible in dark areas. If you have a Go To Telescope, or a Universe2go, finding the planet will be easy as pie. Stars, planets, nebula: but there is more! Namely, a minor planet. One of the most well-known is Ceres, which will be in opposition in October. A first of its kind, the minor planet was discovered in 1801. With a diameter of 963 km, it is the flagship of the asteroid belt. With a brightness of 7.5 mag, the object is easy to spot with a pair of binoculars in the middle of constellation Cetus just under the fish. Despite its brightness, a map wouldn’t hurt if you want to find it. With a Go To telescope, a Universe2go or the new Omegon Push+ object finding system, finding Ceres won’t be a problem. The minor planet will be visible for the entire night, with the meridian occurring shortly after midnight, making the planetoid quite a sight. Three days before the New Moon on the morning of the 28th a razor-thin moon slice will be visible over the eastern horizon. Not far from it you will find Jupiter. The gas giant will stand 1.4° away. A wonderful impression can be experienced with a pair of binoculars of a simple photo lens on a digital camera on a tripod. The night sets far earlier than before, meaning that you can witness an interesting sight between 5 and 6 PM. Deep in the southwestern sky, Venus, Saturn and a young moon will create a beautiful chain in the blue-red dusk sky. Meteor showers are like snowflakes, pelting your windshield during a drive. They appear to all originate from one particular direction. We all know that. In November, we can witness the Leonids, a meteor shower, appearing to come from the constellation Leo. Every 33 years, we see a real flurry of meteors. This year, we only expect to see 20 meteors per hour, racing across the night sky at a speed of 70 km/s. Four days before the new moon, the thin waning Moon will be visible on the eastern horizon. At the same height, about 1.5° away, you will be able to identify the gas giant Jupiter. Both rise until sunrise and the growing light drowns them out.